The wealth pyramid captures these differences. The layers of the wealth pyramid are quite distinctive. The base tier has the most even distribution across regions and countries, but also the most uneven range of personal circumstances. In developed countries, about 20 percent of adults fall within this category. For the majority, membership is either transient – due to business losses or unemployment, for example – or a lifecycle phase associated with youth or old age. In contrast, more than 90 percent of the adult population in India and Africa falls within this range. For many residents of low-income countries, life membership of the base tier is the norm rather than the exception. In terms of global wealth, USD 10,000 –100,000 is the mid-range band. It covers around 900 million adults who represent a high proportion of the middle class in many countries. The average wealth of this group is quite close to the overall global mean wealth. India and Africa are under-represented in this segment, whereas China's share is disproportion­ately high. China and India provide an interesting contrast. India accounts for just 3.1 percent of those with mid-range wealth, and that share has changed very little during the past decade. China accounts for 33 percent of those with wealth between USD 10,000 and USD 100,000, ten times the number of Indians, and double the proportion of Chinese in 2000. The top tiers of the wealth pyramid – covering individuals with net worth above USD 100,000 – comprised 5.9 percent of all adults at the turn of the cen­tury. The proportion rose rapidly until the financial crisis, but has remained quite stable since that time. It currently comprises 8.2 percent of the global total. Regional composition differs markedly from the strata below. 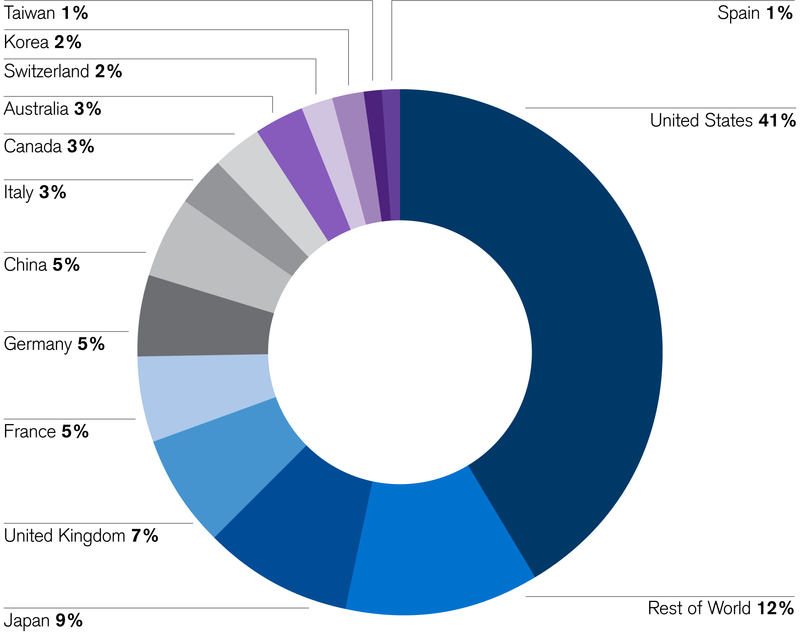 Europe, North America and the Asia-Pacific region (omitting China and India) together account for 89 percent of the group, with Europe alone providing 144 million members (36 percent of the total). This compares with just 5 million adult members (1.2 percent of the global total) in India and Africa combined. The pattern of membership changes once again for the US dollar millionaires at the top of the pyramid. The United States scores high on all three criteria, and has by far the greatest number of millionaires at 13.6 million, or 41 percent of the worldwide total. For many years, Japan held second place in the millionaire rankings– with 13 percent of the global total in 2011. However, the number of Japanese millionaires has fallen, alongside a rise in other countries. a consequence, Japan lost its second place to the United Kingdom in 2014, but bounced back again this year because of exchange rate appreciation. After a drop this year, the United Kingdom falls to third place with 7 percent of millionaires worldwide. 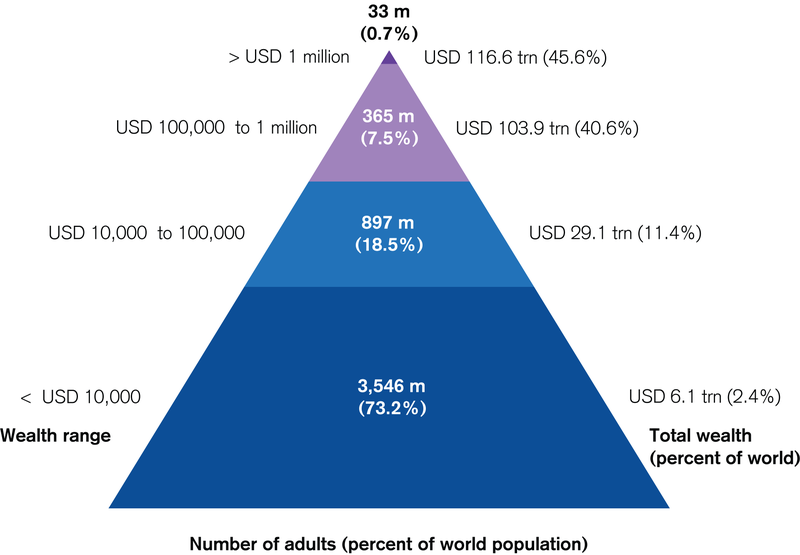 The wealth pyramid captures the contrasting circumstances between those with net wealth of a million US dollars or more, and those lower down in the wealth hierarchy. Discus­sions of wealth holdings often focus exclusively on the top tail. Credit Suisse Global Wealth Report provides a more complete and balanced picture, believing that the base and middle sections are interesting in their own right. One reason is the sheer size of numbers and their political power. However, their combined wealth of USD 35 trillion also yields considerable economic opportunities, which are often overlooked. Addressing the needs of these asset owners can drive new trends in both the consumer and financial industries. China, Korea and Indonesia are examples of countries where individuals have been rising rapidly through this part of the wealth pyramid. India has not shown similar progress to date, but has the potential to grow rapidly in the future from its low starting point. While the middle and lower levels of the pyramid are important, the top segment will likely continue to be the main driver of private asset flows and invest­ment trends. Credit Suisse Research Institute has been publishing its annual Global Wealth Report since 2010. Over the years, the report has established itself as the most comprehensive source of information on global household wealth. It provides complete estimates of wealth, covering all regions and the entire wealth spectrum.